Elastic organization system for electronics and personal items made of a unique weave of rubberized elastic bands. Dimensions: Small: 10.25" x 5.125"; Medium: 12" x 8"; Large: 15" x 9.5"
Weight: Small: 0.4 lb. ; Medium: 0.73 lb. ; Large: 1.06 lbs. This was the perfect size for me. It holds everything I need it to perfectly in place. So many ways to get organized. He travels frequently and was very impressed with this item. If you’re like us, you know the sinking feeling all too well. You can hear your cell phone ringing from its depths, but can only imagine which nook it’s in now. Chargers and headphones have become a tangled nest of cord. Why can you never find your keys, calculator, or hand cream? Don’t fret, the Cocoon GRID-IT! organizer will put a quick end to your fishing expeditions. 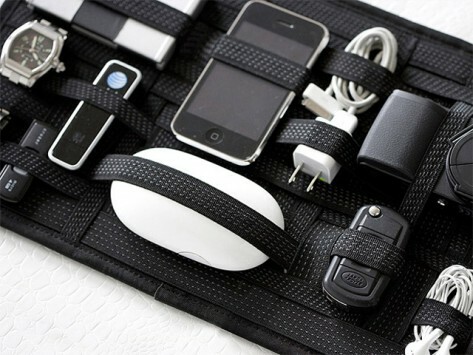 It uses a weave of sticky rubberized elastic webbing to hold your personal objects in place and comes in three sizes to fit any carry-all. 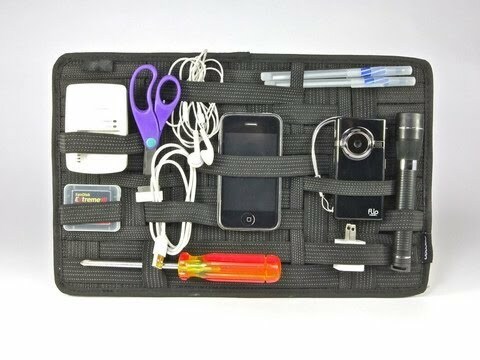 You don’t have to bother with fitting items into a particular slot or pocket; the GRID-IT is a personal organizer that provides hundreds of configurations and ably keeps your stuff visible, secure, and handy. Dario Antonioni, founder of the Los Angeles design studio Orange22, created the system to be versatile, unlike other organizers that tie you to a specific carrying case for each of your myriad gadgets. The flat design makes it easy to slip into a laptop case or backpack, and if you’re a frequent traveler, you can simply pull out your loaded organizer and send it right through the airport security scanner. Kids can use one to keep track of school supplies. And that junk drawer that’s getting out of control? No more excuses.